Choose your needle size based on the type and weight of thread that is being used as well as the fabric that is being sewn. You want the needle to slide easily through the fabric without damaging the fibers while not creating too large of a hole. 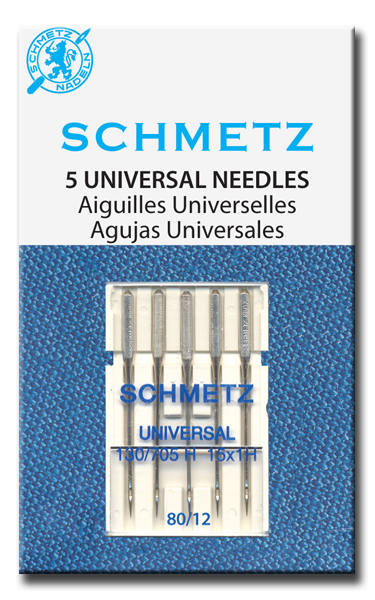 Each package of SCHMETZ needles has European and U.S. size equivalents written at the very bottom of the front of the plastic case. The first number is the European size designation. The number after the / is the US designation. The smaller the number the smaller the needle. If you are sewing through a few layers of a cotton quilting fabric you will probably want a size 12 needle. These needles are suitable for woven fabrics and can be used with all brands and most models of home sewing machines. These are all 5 packs of needles.